Series of photographs of the Sun, London, 1876. James Ferguson, Astronomy explained upon Sir Isaac Newton's Principles (1757). The Ptolemaic system, from ‘Margarita Philosophica’, 1535. Show Girls Get Sun Ray Treatment for ‘Dusky Maiden’ Roles. Plate II, ‘Radiation and Absorption Spectra, 1878. Plate IX: Saturn in 1874. From a drawing by L. Trouvelot. 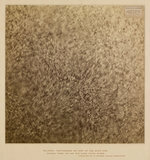 Enlarged photograph of the Sun's disc, original taken 10th May 1878. Large eruptive prominence, John Evershed, Srinagar, Kashmir, 1916. Lithographic colour print issued by Harvard College Observatory in 1876, showing the solar photosphere, the visible surface of the Sun.